We are getting into full Easter mode in our home today, decorating our abode for weekend guests and prepping for our annual egg hunt on Sunday. In the midst of the drudgery of housework last night, I escaped for a little computer break and as my good luck would have it, I stumbled upon this recipe at Sweet Tooth that has my name written all over it. 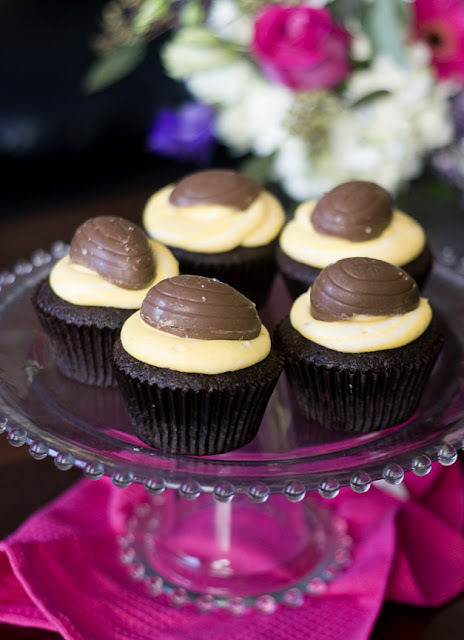 Cadbury Creme Eggs have to be my absolute favourite Easter time goody so how can I resist trying my hand at these delish cupcakes! Preheat the oven to 350 degrees and line 10 muffin tins with cupcake liners. In a medium bowl, sift together the cocoa powder, cake flour, salt, baking soda, and baking powder. In the bowl of an electric mixer, beat together the butter and sugar for 3-4 minutes, until light and fluffy. Add the egg and beat until fully incorporated, scraping the sides of the bowl as necessary. Combine the coffee and milk in a small bowl. With the mixer on low, add half of the dry ingredients into the butter mixture, then add the water and milk. Add the other half of the dry ingredients and beat until just combined. Divide batter among muffin tins, filling liners 2/3 of the way full. Bake for 20-22 minutes, or until cake tester comes out clean. In the bowl of an electric mixer, beat butter 2-3 minutes until light and fluffy. Slowly add half of the powdered sugar and beat until incorporated then add the vanilla extract. Add the rest of the powdered sugar and beat well for 2-5 minutes until frosting is smooth and creamy. Add the creme centers and beat until combined. Add milk 1 tablespoon at a time until the frosting is of desired consistency. Add a little yellow food coloring and gently swirl color into frosting . Transfer frosting to a piping bag fit with a large round tip and frost as desired. Oh how delish of an Easter Treat!! Yum! Thanks for sharing this! Definitely wanna try to make these tomorrow!